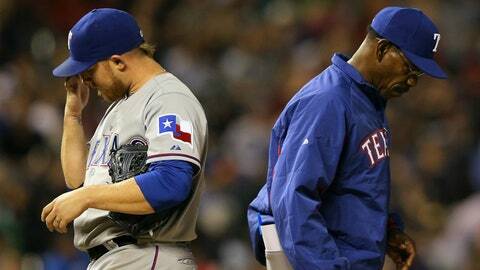 Skipper Ron Washington (right) is dealing with a rotation, which features a 4.60 ERA. What has the higher probability of occurring in 2014, a Yu Darvish no-hitter or Texas Rangers postseason berth? Based on the past week’s events, I’d bet on Darvish — as foolish as that might seem, given the actual odds. But Darvish is an all-world pitcher who made it through 8 2/3 hitless innings twice … technically once, given Wednesday’s controversial scoring change. As for the Rangers in the playoffs: They’re now officially one of the most star-crossed franchises in North American professional sports. The Rangers can’t compete with, say, the Chicago Cubs in anti-folklore or duration of ineptitude. But over the past several years, the pathos surrounding the Rangers’ annual demise has been far more intense than that of the Cubs — or any other baseball team. Mostly, we remember how the Rangers came within one strike of winning the 2011 World Series, at multiple junctures of Game 6. (And that was after a lackluster performance against the Giants in the prior year’s Fall Classic.) The period since has been perhaps even more trying, as talented Texas teams lost winner-take-all home playoff games in 2012 and 2013. The roster evolved dramatically. Josh Hamilton, Michael Young, Ian Kinsler … all gone. 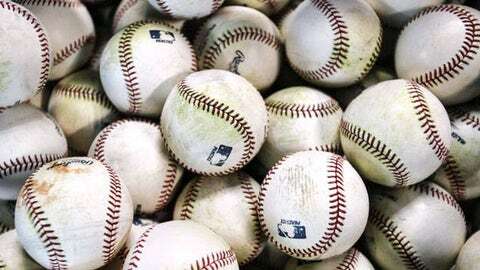 With Wednesday’s news — starting pitchers Matt Harrison and Martin Perez could be lost for the season — it’s hard to envision this year’s Rangers hosting anything more than a banquet after their 162nd game. The Rangers should have at least one World Series title by now. Instead, the franchise is 0 for its first 42 years. What if 2011 was supposed to be their year, and now they’re doomed — by injuries, by underperformance, by bad luck — to an interminable wait for another great chance? If the question is whether the Rangers’ pitching is good enough, the present answer is no. Certainly, Darvish’s credentials are unmatched by all but a handful of his pitching contemporaries. But here are the other names in the current rotation: Colby Lewis, Robbie Ross, Nick Tepesch, and, soon, rookie Nick Martinez. Remember: Left-hander Derek Holland is on the disabled list. So is Tanner Scheppers, the Opening Day starter. The often-electric Alexi Ogando hasn’t proven durable enough to start. The end result: The Rangers’ rotation ERA this season is 4.60. No team reached the postseason last year with a mark higher than 3.92. The numbers are particularly alarming, in a division that features the A’s (best team ERA in AL), Mariners (above-average rotation with Felix Hernandez and Hisashi Iwakuma), and Angels (Garrett Richards, their No. 3 starter, looks like an All-Star). Could the Rangers’ good-but-not-great lineup awaken in the second half, once Prince Fielder discovers the right-field jet stream on a more regular basis? Sure. But without healthy versions of Harrison and Perez, the Rangers don’t have a postseason-caliber rotation. And I’m beginning to wonder when they will again.